For about two years now, Cars of Hope supports refugees on the so-called Balkan route. In the past year mainly in Greece and Serbia, but before also in Austria, Croatia, Hungary and Slovenia. After the European borders were closed and a refugee camp in Idomeni (Greece, at the border with Macedonia) was evicted, the refugee topic disappeared out of German media, but their situation has worsened once more. The distress of the people is still omnipresent and bigger than ever before. The work of cars of Hope on the Balkan route is energy-sapping. Because of this the activists regenerated in the last two months and prepared new actions to support refugees. In August and September they will drive to Greece again. The German activists will support refugees in Athens and at Lesvos. In an interview member of the Enough team and co-founder of Cars of Hope Wuppertal, René Schuijlenburg, explained his motivation to be active on the Balkan route earlier this week.For hm its important to work at eye-level and thats its all about solidarity, not charity. After the big Refugees Welcome hype in 2015, a lot has changed and its getting harder and harder to receive enough donations to continue the work with refugees on the Balkan route and in countries like Italy and France. YOU can make a difference. Groups like Cars of Hope are always looking for people to join them and are only able to do their work when enough people donate and help to spread information and crowdfunding links. Evene very small donations can make a difference. Read the statement from Cars of Hope Wuppertal below the donation details. After the eviction of Idomeni in May 2016, we continued our work. In cooperation with Soul Food Kitchen we distributed hot meals, hot tea and blankets to homeless Greeks and refugees in Thessaloniki. Furthermore we pressed ahead to extend and improve the infrastructure of Soul Food Kitchen. We co-financed and build a new floor in the kitchen to make sure the people in the kitchen could continue to take care of stranded people who are out of money. The old floor was full of cracks and unevenness. This made it almost impossible to keep the kitchen clean and to prepare food with the necessary hygiene standards. Sould Food Kitchen cooks several hundred meals for homeless Greeks and refugees on a daily basis. We also supported several families, who were living in appartments in and around Thessaloniki after the evicition of Idomeni. We supported the Refugee Shelter Project of the Micropolis social center with food and sanitary products. The self-organised Refugee Shelter Project provides apartments for 80 families in Thessaloniki. 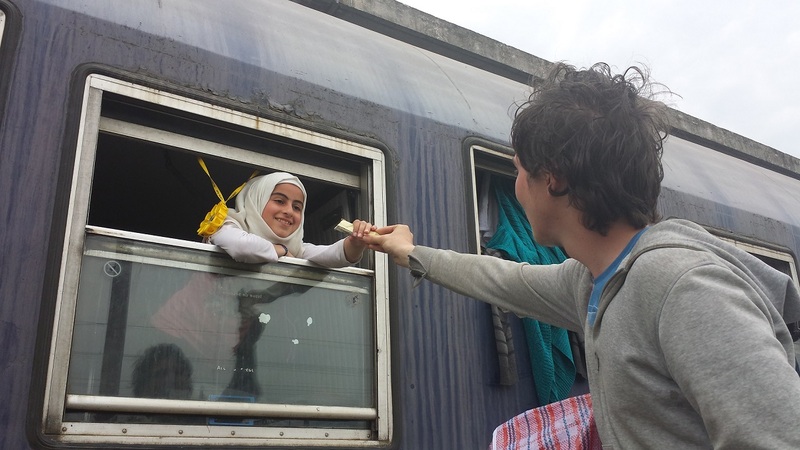 In the first six months of this year we focussed on our work with refugees in Serbia. We supported refugees in the squatted (and now evicted) barracks in Belgrade and in Sid. One of the groups we were working with was Soul Welders. In the cold Serbian winter we were welding stoves. People used them to keep warm and to cook in the cold Serbian winter. We also helped to transform a truck into a mobile shower truck. Four people could take a shower at the same time. This was urgently needed as there were no showers in the barracks. Many refugees were happy to take a shower in the truck. Our work on the Balkan route is energy-sapping. Because of this we regenerated in the last two months and prepared new actions to support refuges. In August and September we will drive to Greece again. We will support refugees in Athens and at Lesvos. In Athens hundreds of refugees are threatened with eviction. These people are living in self-organised projects. In our view these squats are necessary because its not possible for refugees to live in dignity in the state camps. Apart from institutional repression after a possible eviction, the refugees in the squats are facing the threat to have to live in the state refugee camps which are runned by the military and where there is often not enough or bad food and a lack of other necessities. During our work on the Balkan route we observed that people who lived in self-organised projects could live their life in dignity. This is something that is not the case in state camps in Europe. At Lesvos many refugees live in a kind of „open-air prison“. Since the EU/Turkey deal was implemented, refugees are not allowed (and can’t) to leave the island. In the Moria camp are about twice as many people living as the official maximum capacity. No wonder that the cirumstances there are reminding of dark times in European history. No only the humanitarian condition is in a permanent bad state, refugees are also confronted with police violence on a regular basis. We see it as our job to support these people and to sustainable improve the situation they are forced to live in. Our work with refugees is costing a lot of money. Apart from the costs to ditribute food and sanitary products and building up mobile charging stations for cell phones, we also have travel expenses. In the coming months people will again working with Cars of Hope on the European refugee routes. To be able to support as many people as possible we want to ask you to continue to support our work with donations. We also want to use this opportunity to thank all organisations, initiatives and people who have supported our work until now. Without the support of Sozialtal e.V., the local initiative Willkommen in Cronenberg, the Ada Café, the Klub, the Stilbruch Café, the Wirtschaftswunder, the now closed Café Multi Kulti, the AZ Wuppertal (autonomous center) and the Blockshock dj’s and all those other people and initiatives our work would not have been possible. MANY THANKS! By supporting our crowdfunding campaign or a transfer on our bank- or Paypal account you are not just supporting our work. You are the ones who make our work possible. This is why we are happy with any donation, even the very small ones. We do our bookkeeping with Sozialtal e.V. If you want to ask for a receipt of your donation; Please send an email to carsofhopewtal@gmx.de with your full name and adress so we can send you the receipt. Tax payers in Germany can use the receipt for a tax deduction. #Philippines: Lumad Communities Resisting Extractive Operations | Enough is Enough! Reclaim #Làbas is a Fight for the Future of #Bologna | Enough is Enough! #RefugeesGR #CityPlaza #Athens: Open talk with Shahram Khosravi, Author of “Illegal” Traveller | Enough is Enough! #SouthAfrica: #Abahlali BaseMjondolo Activists Kidnapped & Tortured | Enough is Enough! After #Berkeley: #NLG #SF Says “We are All #Antifa!” | Enough is Enough! Greek Anarchists: Solidarity With #Linksunten #Indymedia | Enough is Enough! #Greece: Prisoners in #Chania Prison Announce Protests | Enough is Enough! #Greece: Solidarity With Imprisoned Comrades in Italy From 111 Squat in #Thessaloniki | Enough is Enough! Photos and Further Details from the August ICE/HSI/OPD Raid in West #Oakland | Enough is Enough! #Charlottesville: PA Alt-Knights Provided Security for Holocaust Denier and Fascist Augustus Invictus at #UnitetheRight | Enough is Enough! #Prague: #Klinika Social Center Under Threat of Eviction | Enough is Enough! Report #Freiburg: 800 People Took the Streets in Solidarity With #Linksunten | Enough is Enough! #Amsterdam September 15: Info Evening: Anarchists from #Argentina; Struggles and Repression | Enough is Enough! #France: Anarchists Join General Strike | Enough is Enough! #WelcomeUnited Mass Deportation Alert in #Germany: Protests Announced | Enough is Enough! #Vancouver, #WA: Fascist Arrested After He Attempted Twice to Run Over #Antifa Protesters With His Truck | Enough is Enough!